If you have a reliable car from pre-1979, 4 weeks to spare in July 2013, and a sense of adventure, you qualify for the LH 2013 Centennial Tour! Our goal is to gather 100 participants who will ship their historic vehicles to the U.S from overseas and spend 4 weeks crossing the American Continent on the Lincoln Highway. This will help raise public awareness and renew interest in the Lincoln Highway during its centennial celebration. 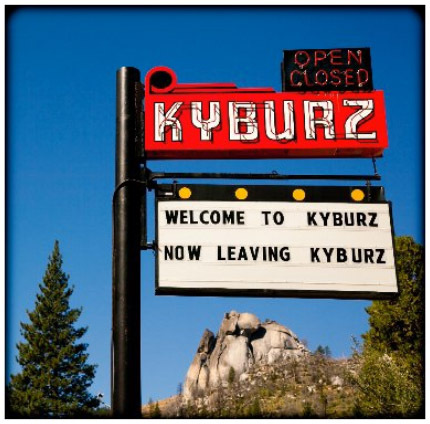 U.S residents are also encouraged to join the tour making it as grand and diverse as possible. 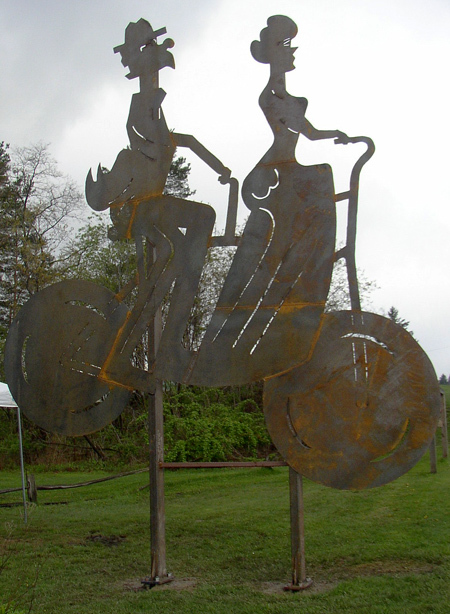 The tour will conclude at the Lincoln Highway’s western terminus; the Lincoln Park in San Francisco on July 26th, 2013, having covered an approximate 3,389 miles and journeyed through 13 states. In June 2006, 17 antique American cars from Norway traveled Route 66 on its 80th anniversary. The trip was a private initiative by Harry & Henning Kjensli accompanied by friends and like minded Norwegian enthusiasts. The response received from participants and the public inspired them to launch the 2013 Lincoln Highway Centennial Tour. Check the web site for more info, including a schedule of each day’s travels. Indiana Lt. Governor Becky Skillman, and INDOT Commissioner Michael B. Cline, have signed a resolution designating the historic Lincoln Highway across northern Indiana as an official Indiana state byway. The Indiana portion of the Lincoln Highway now becomes part of the Indiana Byways Program. 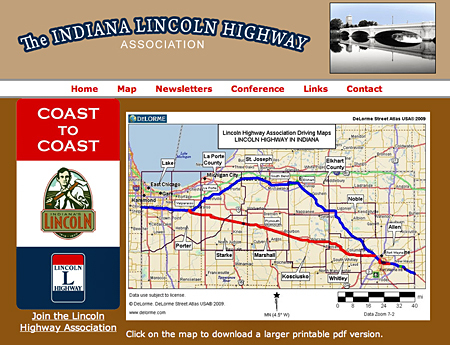 The Indiana Lincoln Highway Association (INLHA) was incorporated in 2008 to begin work on the state byway designation. Through private donations from Indiana Lincoln Highway Association members, funds from Indiana Landmarks, and funds from the national Lincoln Highway Association, the INLHA conducted a resource survey to identify the route. Also identified were significant structures relating to Indiana Lincoln Highway such as historic bridges, tourist cabins, motels, gas stations, Lincoln Highway markers and monuments, and tourist camps. Approximately two years ago the INLHA submitted a state byway application to INDOT. Following two review meetings and the approval of the Metropolitan Planning Organizations (MPOs) across northern Indiana, the application was recently processed for signature by state officials. The INLHA will now form the Indiana Lincoln Highway Byway Council with representatives from across the state. The INLHA and the Council will oversee the development of a Corridor Management plan that will include guidelines for road signage and the creation of tourism materials to promote the towns and businesses and events held along the route. For more information, contact the Indiana Lincoln Highway office at 574-210-6278 or contact Jan Shupert-Arick, President, INLHA, at 260-452-8140. The Ohio chapters of the national Lincoln Highway Association, along with the official Ohio Lincoln Highway Historic Byway, are planning to bring over 200 visitors to the McKinley Grand Hotel in June 2012 for a week of lectures, seminars, day-long road trips, and banquets all with the theme of “Pathways & Presidents” and celebrating the Lincoln Highway. The 2012 Lincoln Highway Association conference begins Monday, June 18, with a welcome reception open to anyone wishing to have answers about the historic road. Later in the week will be a special Marmon automobile exhibit. In addition to official East and West tours, organizer Jim Cassler says there will be additional trips focusing on Ohio’s Amish Country, a train ride on the Cuyahoga Valley Scenic Railway, and a trip to the Packard Museum in Warren honoring Lincoln Highway co-founder Henry Joy, then President of Packard Motors. Presidential activities will include Canton’s McKinley and the First Ladies Museum, while a trip to Marion will highlight Warren Harding’s involvement in the early highway. 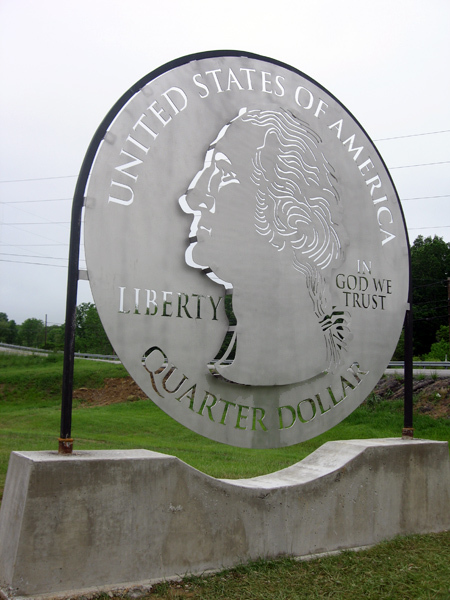 Visit www.lincolnhighwayassoc.org or www.historicbyway.com for general history of the highway. Registration information will be available there at a later date. Lincoln Highway Association Past-President Jan Shupert- Arick wrote to say that John Martin Smith was killed on I-69 last night with his wife Bobbie. He was a key figure in founding the Auburn-Cord-Duesenberg Museum and the National Automotive and Truck Museum in Auburn, Indiana, both of which were visited during the LHA conference in 2003. Jan writes, “John Martin was a prolific historian and preservationist. He was a friend and colleague and will be deeply missed. His wife Bobbie worked many years at the NATMUS Museum.” Image from http://www.kpcnews.net/. For 14 years, Eric and Kass Mencher have devoted their photographic passion to visually documenting the landmarks, landscapes, and people of the Lincoln Highway. They’re in the final stages of self-publishing a book that celebrates the road’s upcoming anniversary. 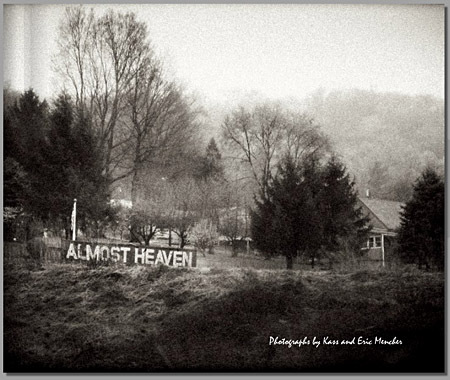 To see a still-evolving 200+ page prototype click here to see “Almost Heaven.” Make it Full Screen to see the images large. 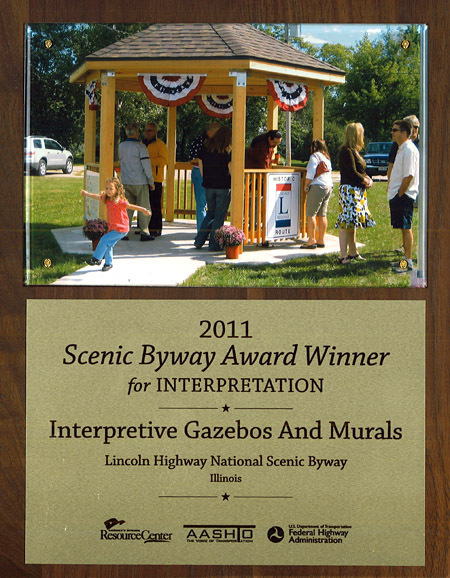 The Lincoln Highway National Scenic Byway in Illinois received a Scenic Byway Award for the “Interpretive Gazebos and Murals” project in the Interpretation category at the National Scenic Byways 2011 Conference in Minneapolis, Minnesota. 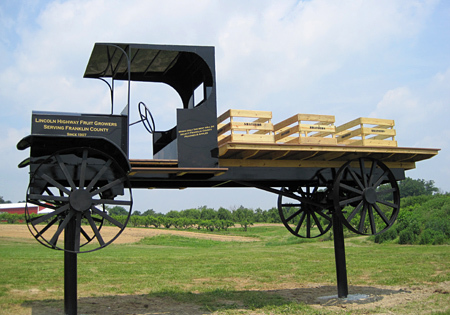 The large-scale works of art not only relay the significance and history of the Lincoln Highway, but serve as modern-day tourist attractions themselves. 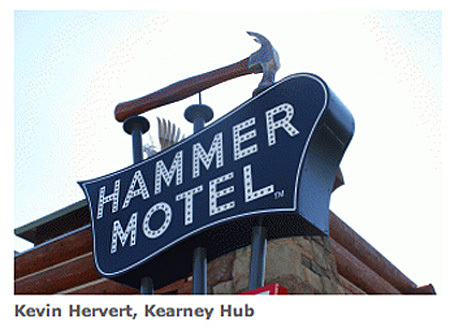 The artwork is produced by Jay Allen at his ShawCraft Sign Co. of Machesney Park, Illinois. 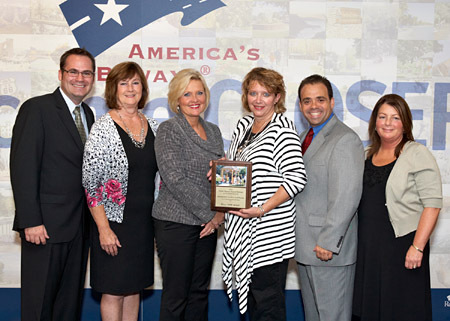 Accepting the award, above from left: Justin Hardee, Heritage Corridor CVB; Melissa Hendricks-Kribs, Illinois Department of Transportation; Cindi Fleischli, Illinois Office of Tourism; Bonnie Heimbach, Northern Illinois Tourism; Bob Navarro, Heritage Corridor CVB; and Sue Hronik, Illinois Lincoln Highway Coalition. 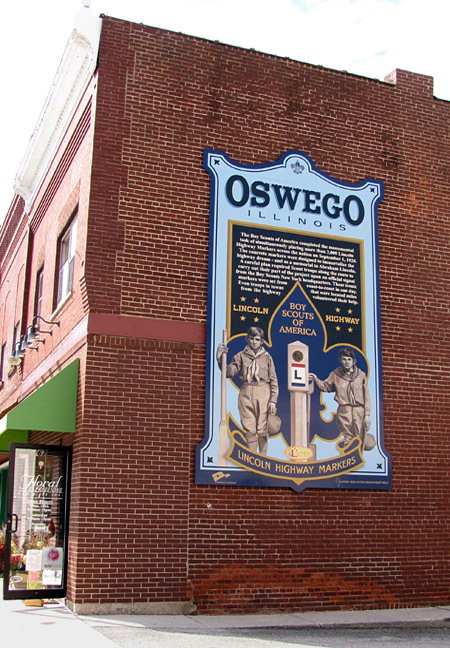 The newest Illinois Lincoln Highway Interpretive Mural was installed last week at 67 Main Street in Oswego, Illinois. Only the second vertical mural, it recalls the story of the Boy Scouts of America simultaneously planting thousands of Lincoln Highway concrete directional posts across the nation in 1928. For more information on the Illinois Lincoln Highway, places to see and things to do, exciting, historic stories and to download an Illinois Lincoln Highway Visitor Guide, please visit drivelincolnhighway.com/.